For part 1 of the story of Sniff the talking dog with a nose for the supernatural, click here. “Can I pet your dog?” she had asked, retrieving me from where I had been lost in thought. She was beautiful in the kind of way that makes you forget your own name. “Uhh..yeah,” I responded. Then I came to my senses and added, “He’s very friendly!” She leaned forward to pet him as I stood an awkward audience to the interaction. In her one hand was a paper cup of coffee. The other arm was bent upward, an expensive designer purse dangling from the crook of her elbow. She wore a beige blouse accented by a necklace dangling several light purple stones of varying sizes. As she crouched and reached her palm towards Sniff to let him smell her, his tail began wagging ferociously until his whole body spasmed with excitement. With a small hop forward, he knocked the coffee out of her hand with his nose. It fell just far enough away not to splatter onto her white pants. I was so embarrassed and perplexed. Sniff didn’t usually react this way to people. I tightened my grip on his leash, fearing that he might jump up at her to lick her face and knock her off balance. “I’m so sorry!” I apologized, but she was laughing as she looked over her shoulder to locate the overturned cup. Sniff was licking her hand and she pet his head. “He’s an interesting dog. With a very talented nose,” I smiled, doing my best not to look her in the eyes. There is no way that I would ever have initiated a conversation with a girl like this. My gaze fell on the cup several feet away. “I’m Silas, by the way,” I said, reaching out for a handshake. She took my hand and pulled herself up, which I wasn’t ready for. I clumsily fumbled with my footing to keep from losing my balance and Gea laughed. “Offer to buy her coffee! Offer to buy her coffee! Offer to buy her coffee!” Sniff’s voice said inside my head. I opened my mouth to comply with my very talented companion’s command, but Gea was already backing away. She wore a wide grin as she said, “It was such a pleasure to meet you, Silas, and Sniff the dog with the very talented nose!” And just like that, she was gone. At 3 AM that night, I woke up to Sniff howling mournfully. It was a noise I had never heard any living thing make before, a pure distillation of grief and loss. Inside of me, my soul longed to howl too, but the emotion caught in my throat and I coughed and spat and cried. I had no idea what we were sad about, and Sniff couldn’t put it into words that I could understand. I wrapped my arms around him and we stayed that way for several hours. Then, Sniff jumped down from the bed, grabbed his leash and pointed towards the door. His urgency was scaring me. I didn’t ask any questions, just put on my clothes and let him pull me out of our hotel room, down the hallway and out into the streets. Everything was dark and ominous in the pre-dawn hour. Later, as the sun began to pierce the night, the light would make the alleyways seem that much more foreboding as rust and grime and age were revealed. Through the randomness of memory or through Sniff’s urging of my subconscious, I can’t be sure – but I found my mind flooded with some of our prior conversations as he pulled me along towards a destination unknown to me. Our treasure hunting business was thriving. We were traveling less for work and more for enjoyment. I thought we seemed pretty happy, but Sniff kept bringing up the topic of “the pack.” The pair of us were “the pack,” and would always be there for each other, but “the pack” didn’t have to stop at two. There could be more. “People shouldn’t be alone,” he would say to me. To which I responded, “I’m not alone. I have you, Sniff.” He got tired of hearing this eventually and said, “It’s not the same. You need another person.” When I heard his voice inside my head, sometimes it spoke with an underlying tone of sympathy. Sniff felt bad for me. I think he always has, seeing as how my hardship is what drew him to me to begin with, but the last couple of months were different. “And what about you? Do you need another dog?” I had replied. “No, that’s different.” He didn’t explain why. As Sniff pulled me along, all of our surroundings were getting older and older. Minutes after dawn, we found ourselves on stone streets lined with brick buildings wearing antique wooden doors. 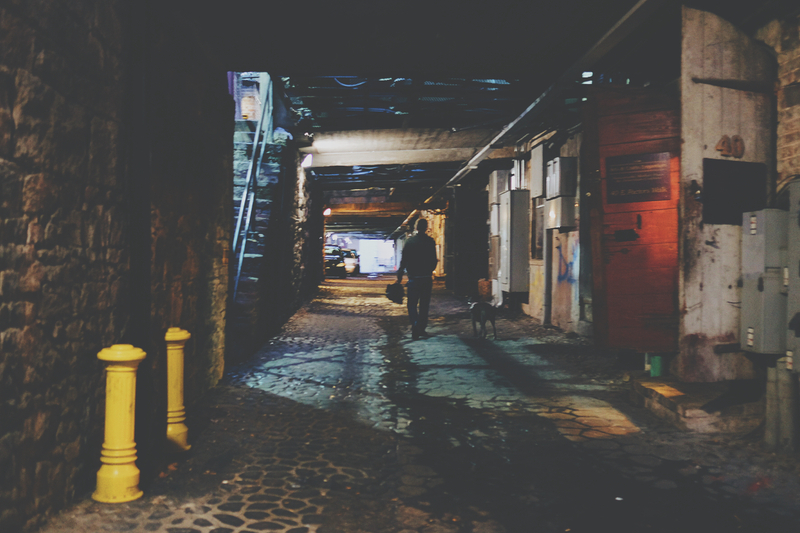 A stillness in the air made me hyper-aware of every tiny noise around us as Sniff led me into a dark alleyway like a tunnel carved through the old building above. My heartbeat was racing with fear and anticipation as our pace slowed. I could see a knot of yellow plastic crime scene tape still secured to a metal pipe on one side of the walkway. Something terrible had happened here: something that had been scrubbed away; something that people hoped to forget. Sniff’s howl reverberated through my memory and I knew that it had to do with Gea; that Sniff had hoped that she might come to join the pack; that from the moment we both laid eyes on her, we were in love and a part of us longed to become a family. Sniff explained to me as gently as he could that she had been stabbed to death, right here. Her blood had been scrubbed away, the body that used to be her carted off. The alleyway clean and new, as if none of it had ever happened; as if Gea had never existed. I caught myself grinding my teeth as I said, “There should be a monument here for her. She mattered. Her tragedy shouldn’t be bleached away and forgotten.” My eyes welled up with tears again. “We have to save her,” I said immediately. I had never seen Sniff like this, so cautious, so afraid. He seemed so nervous about saying the wrong thing. My heartbeat was racing as I remembered my short encounter with Gea, her spilled cup of coffee that I never got to replace, the longing in my chest knowing that I will never see her again. “We will have to explain to her what happened, to help her move on. She’s all alone right now. People shouldn’t be alone,” he continued. I nodded hesitantly. With his nose, Sniff pointed to a corner behind a dumpster. I took him off of his leash to free my hands and pulled the handkerchief from my pocket as I reached down and picked up the knife. I studied the brown stains along the blade and handle. When I looked up, Gea was standing in front of me, her eyes squinting at the knife and then moving to my face. I opened my mouth to tell her everything, to explain what happened and that it was horrible but that she had to move on. My lips parted to help her find peace and closure, but my heart ached at the sight of her: scared, alone, beautiful beyond description and the words that she so desperately needed to hear caught in my throat, leaving only silence between us.